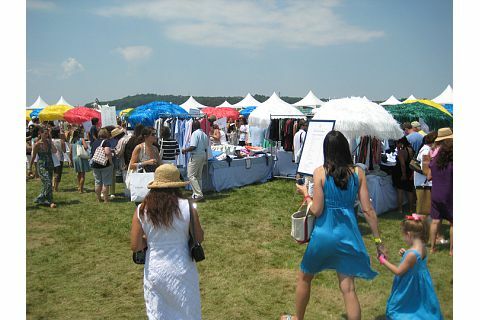 Super Saturday in the Hamptons is an event you don’t want to miss and you want to make sure you’re at every single year. We are obsessed with the event and what it stands for. Super Saturday leaves an impact and it’s a BIG ONE! What combines fabulous fashion, great fun, and the friendly mingling of shoppers and celebrities? 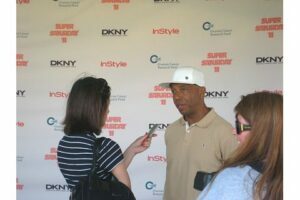 SUPER SATURDAY… an annual “Designer Garage Sale” sponsored by Donna Karan and InStyle to benefit the Ovarian Cancer Research Fund. The Ovarian Cancer Research Fund was founded in 1994, and its mission is to fund cancer research into early detection and ultimately a cure of ovarian cancer. OCRF assists patients and their loved ones to understand the disease, its treatment, and provide outreach programs to raise public awareness. Since 1998, the OCRF has awarded over $28 million in grants to the study and cure of cancer research at over 40 leading medical centers in the United States. … everything you can imagine for adults and kids alike! I’ll start with the adults for you fashionistas out there. Can you say “fabulous” 10 times really fast? How about 174 times? That’s how many “Garage Sale” designer participants were there. I’m talking 7 for all mankind, Betsey Johnson, Calvin Klein, Coach, Dooney & Bourke, Free People, Henri Bendel, Kate Spade, Kenneth Cole, LAMB Handbags, MaxStudio, Marc Jacobs, Nautica, Donna Karan, DKNY, Nicole Miller, Prada, Rock & Republic, Shoshanna, Ralph Lauren, Tommy Hilfiger, Vera Wang, Victoria’s Secret, Wes + Willy, Vivienne Tam and dozens and dozens more. All I had to do was browse the outdoor flea-market style aisles and choose from the incredible bargains. “Bargains, you say?” Well, do you define THIS as a bargain? Within an hour, I had in my possession one pair of 7 for all mankind jeans, a Vivienne Tam sundress and Vivienne Tam black shirt, 3 pairs of French Connection white linen pants, 2 Magaschoni sweaters, 1 Jill Stuart dressy blouse, 1 Shoshanna bikini and a LAMB Handbag. Total cost? $300.00. No, not for just the Vivienne Tam sundress! The TOTAL for EVERYTHING. And my day was just beginning. 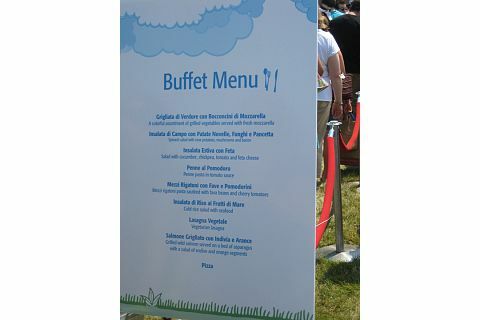 Of course, all that shopping made me very, very hungry… so off I headed to the buffet tents and outdoor dining area. Check out the menu! Need I say more? 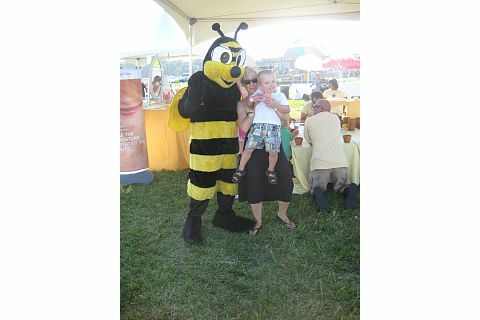 And, of course, I wanted to see my grandchildren having the grandest time at the SUPER SATURDAY kid exclusive “Day on the Farm and Carnival”… and oh, this collection of games, rides, arts & crafts, activities, music, theater, “gardening” with Burt’s Bees’ Buzzy the Bee, and even hand massages was truly a complete day of fun. 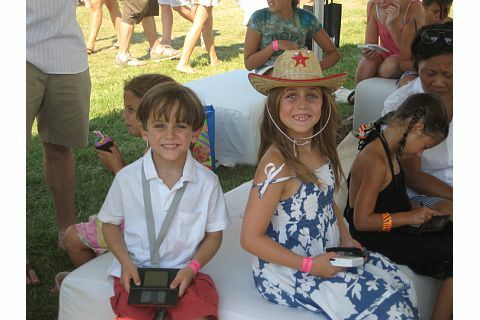 There were Polo Ralph Lauren t-shirts to decorate. Crumbs Bakeshop cupcakes, cookies and brownies to decorate. The DwellStudio and FatBoy Kids Lounge to chill out in while catching an awesome performance. Performances by Broadway Babies to catch. Positive life skills to learn at Spirituality for Kids. And the ever-popular pony rides, and activities about the very special land and farm at Nova’s Art Project. OK. Back to shopping (well, first a stop at one of the multiple air-conditioned portable ladies’ rooms). And the fun mingling with the designers and celebrities who bring their support to this most worthy cause. Ah… the day was winding down. A couple more photos. And the famous Super Saturday Goodie Bag. Stuffed to the brim with everything you can imagine, each child and adult receives a beyond-fabulous Goodie Bag when leaving the Super Saturday Garage Sale. This past Saturday’s Super Saturday 11 is the 6th Super Saturday event that my family has attended. And we love it. When you’re there, you truly see the commitment that the event has dedicated to the Ovarian Cancer Research Fund… with its sponsors, its designer participants, its benefactors and patrons, and its special celebrity guests. Yes, you do have a wonderful day of shopping and bargaining and eating and sipping summer drinks. And the kids fall asleep the second they hit their carseats. But what you really feel is the larger goal of supporting the mission to raise funds and awareness to find a cure for Ovarian Cancer. This will make every Saturday super. Everyone in my family had better be good and healthy next summer cause I want to go to this next year. It looks like a ton of fun and my work wardrobe could definitely use some help at those bargain prices. Wow, that IS fabulous! I’m so jealous, especially after reading all that you got for $300. Amazing!! Fun! I love shopping, but can’t say I’m much of a fashionista. I’ve said it before, I’ll say it again….do you need another daughter? I’d totally put myself up for adoption! I want to go!